One thing that I never liked with the Sprinter 3500 were the tiny 15 inch factory wheels. I have no idea why they used these small wheels in these wheel arches that can house much bigger wheels. To fix this, there are basically two alternatives: stick with the original 15″ wheels and put some bigger tires on them or go with larger 16″ wheels from the newer generation Sprinters (2007+). If you go the first route with the original wheels, your choice of tires is limited – there’s not even a large selection for the standard 195/70R15 tires. So my choice was going with the larger wheels. 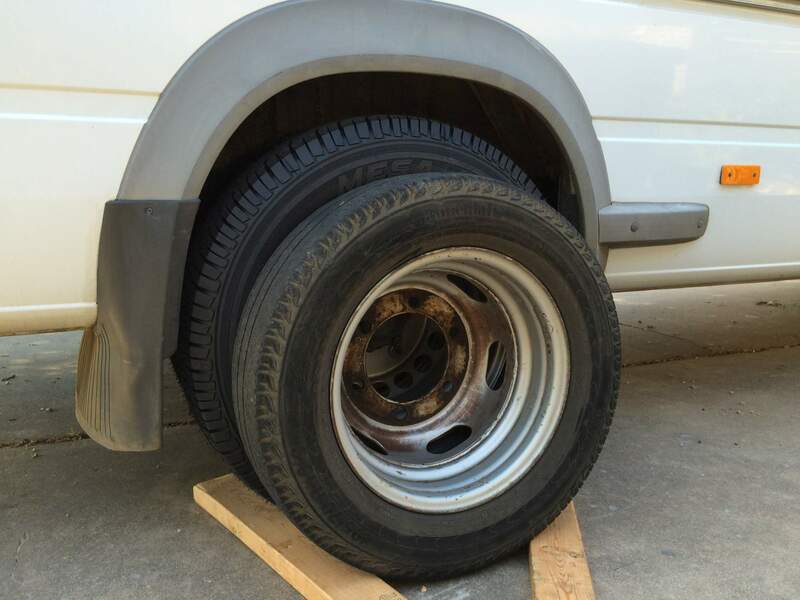 Finding the wheels is no problem – there are plenty of companies that sell barely used wheels from RV conversions for about $50 a piece plus shipping (Eurocampers, for example). I got really lucky and found a seller on eBay that accepted my offer of $40 per wheel, shipping included! The 16″ wheels have the same bolt pattern as the 15″ from the first generation Sprinters but you’ll need new lug nuts. The Part Number for the nuts is 68013445AA (Dodge/Mopar Part Number) and you’ll need 24 of them. Going with the larger wheels has another upside: There’s plenty of tires with the correct load rating to select from. I didn’t go with the cheapest tire but opted for a house brand from NTB: Mesa A/P II LT215/85R16. I can’t speak to the quality of the tire yet since I’ve only driven about 50 miles so far. First impression is better than the older tires but I’m going to update this post after the first longer road trip. and here’s the results after driving the larger wheels for a while. The new wheel/tire combination lifted the van about two inches and I had to cut a little bit from the front wheel splash guard to avoid having the front tires rubbing against it when turning. The picture above shows that there’s more than enough space between the duallys in the back. You could also go with a bit smaller but wider tires and chose LT225/75R16 tires. One negative of going with bigger tires is that your spare tire won’t fit in original location anymore. 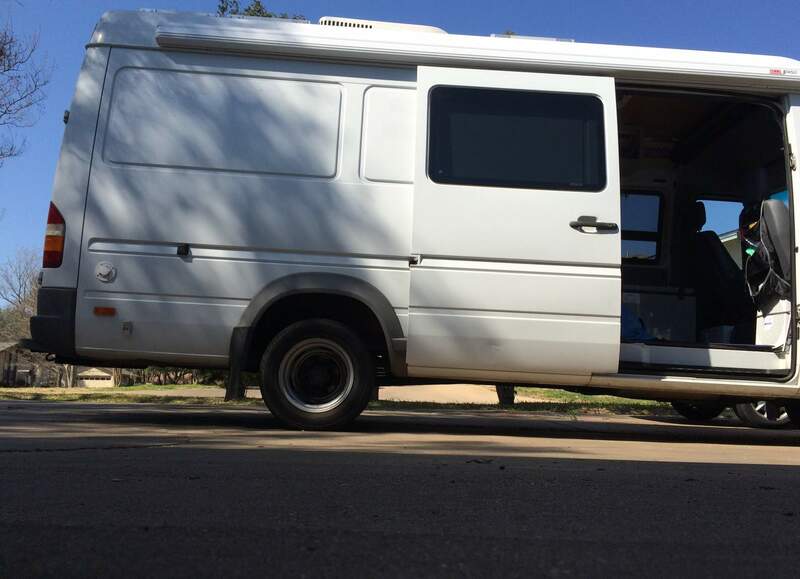 I saw a post on Expeditionportal with a picture of a 215/85R16 in the stock location but since this was about a Sprinter 2500 I assume that the wheel carrier in the 3500’s are probably smaller. If you could swap out the carriers from a 2500 to a 3500 this would solve the problem but I haven’t looked into that. I’m going with a spare wheel carrier that is bolted to the rear door. When researching tires I found a good amount of information and pictures how the new setup would look like but what I haven’t found was a lot of side by side comparisons. 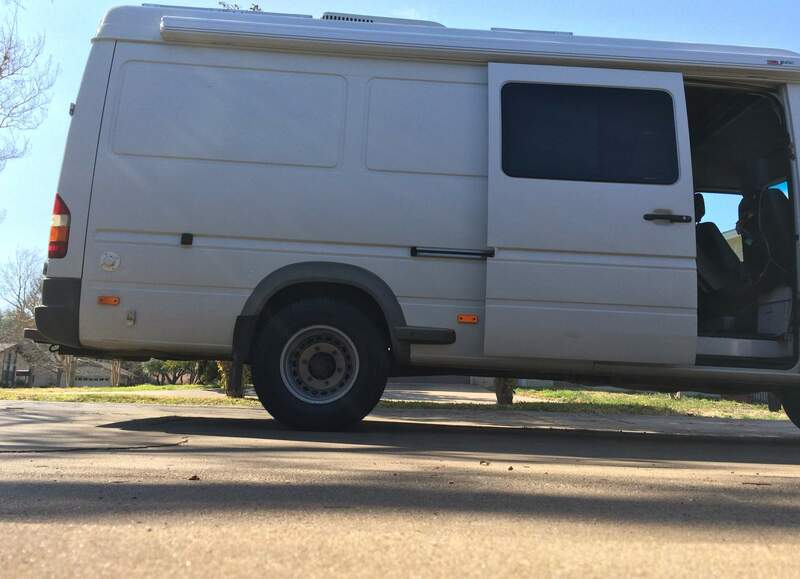 I hope the pictures and especially the comparison slider on top of this post are helpful for someone to get an idea how your Sprinter would look like with bigger tires. Great info! Doing the same wheel swap to my 3500 now. Im assuming you tossed the stock inner and outer cone-shaped washers that lined up the 15″ wheels? I bought 2007+ lug nuts. Is that all I need? I really appreciate your info! yes, no washer required with the 16″ wheels and the 2007+ lug nuts. What about the front wheels? Was teh clearance good for the turning radius? After talking to most tire places the front seems to be of more concern than the gap on the back wheels, a lot of people won’t install bigger wheels because the percent increase goes over their allowable “limit”. Did you have to do any cutting in the front? I had to cut a little bit from the inner side of the front splash guard to avoid rubbing with the tires when making a tight turn. Other than that the wheels are fine. I just came back from a 6000 miles road trip without any issues at all. the mpg didn’t change that much, I’m still averaging 23 mpg. The only “downside” is that both the speed and the mileage on the dash is off by 18% but I have an UltraGauge that shows the correct speed and mileage, so no big deal. Thanks for this write up!!! I ordered my rims ($45 each with no shipping charge- suppose to be new / take offs) and think I will use the same size tires you did 215 85r 16. Bigger is better but would hate to risk duallys rubbing together or losing any of my tight turning. Im rolling a 2005 3500 144… HAS to be better than these tiny hard a$s tires now ;/ Are you still happy, no rub, no regrets?? I’m still happy with my larger tires. the ride is much smoother and the look is soooooo much better than before. I’ve read that the stock tire sizes for the 3500 front and rear are different from each other. Is it possible that you also found a solution to this issue by going with the larger (universal) size? I have 2017 3500, and yes the tire sizes are different. Rear runs a 285, front 195. 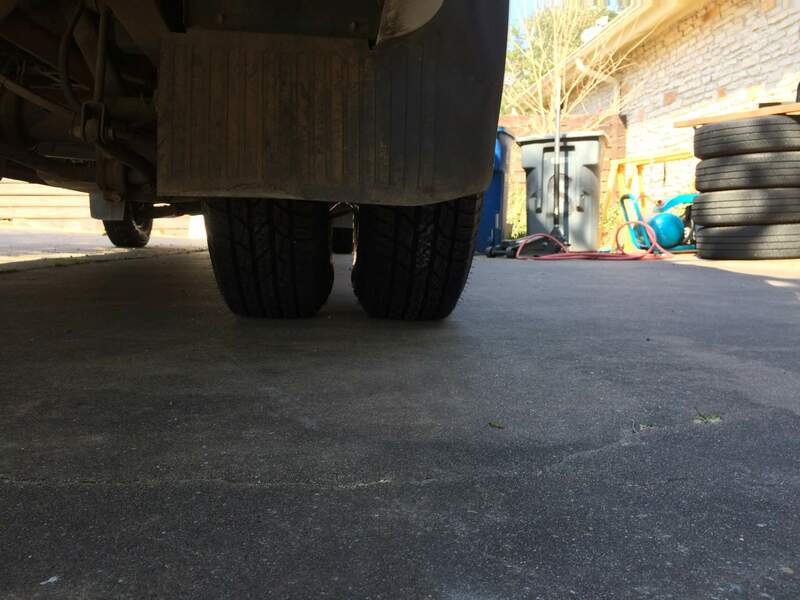 I purchased a universal tire set with off-road tread 265/75/16 and it created a issue with the wheel sensors immediately. Put the van in limp mode. Still haven’t found a solution. Hope someone has had success as I really need the tires and clearance. Hello!! 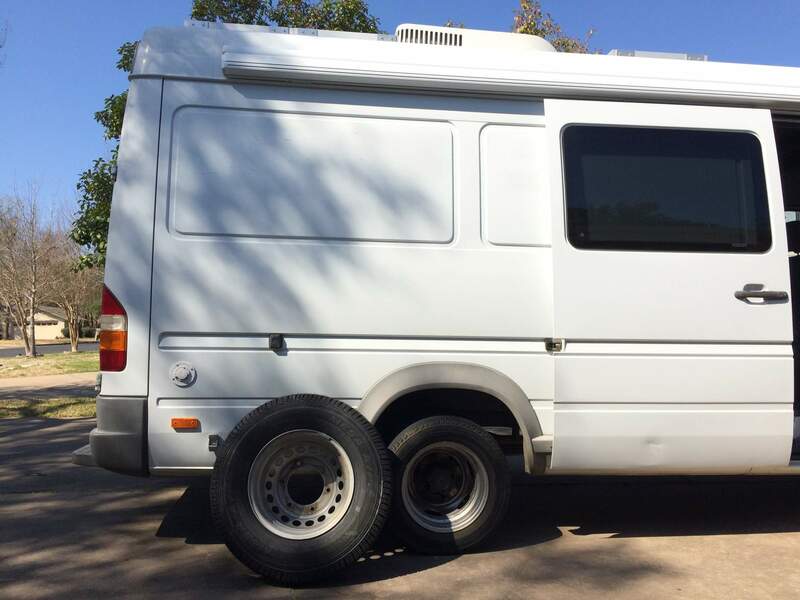 About to do the conversion for my van. Where did you end up cutting material off in the front wheel well and how did you figure that out?